How artisan is that? Such finesse. Such forethought. A cut above your standard ‘bunch of c*nts’ schlock constantly peddled on pub toilet walls and football blog comment sections. 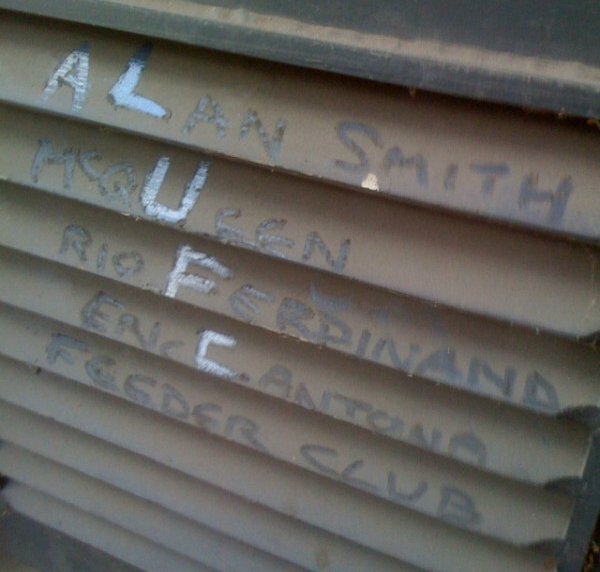 As Matt (we won’t ask what he was doing on a fire escape in Leeds) says, it’s nice to imagine that the United fan responsible arrived by train, etched his masterpiece and then left immediately. Covert operation. In and out. Kudos to you Sir, wherever you may be. Doths hat in appreciation. Quality work. I bet they spent ages thinking about the “U”! What ever happened to Alan Smith?